NOTE: This drive is not recommended for new applications. We recommend the STAC6-S for 120 VAC applications or the STAC6-S-220 for 220 VAC applications. For assistance in selecting the best stepper drive for your application contact us. 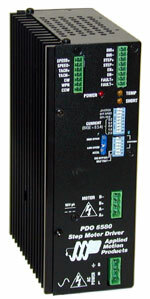 The PDO5580 stepper drive is packaged in a rugged steel case. Integral heat sink, mounting brackets, and connectors are included with each drive. The drive comes factory set for 110 VAC operation, but can be switched to operate on 220 single-phase VAC as well. The drive is recommended for use with NEMA 23 and 34 frame step motors to create a complete stepper motion solution. Pluggable mating screw terminal blocks are provided with each drive for connecting the motor, AC input, and I/O. The PDO5580 also features a Self Test function for troubleshooting the motor connection. If you are unsure about the motor or signal connections to the drive you can use the self test function to verify that the motor is turning properly in both directions. The drive is protected from over-temperature conditions as well as motor over-current and short circuit conditions.